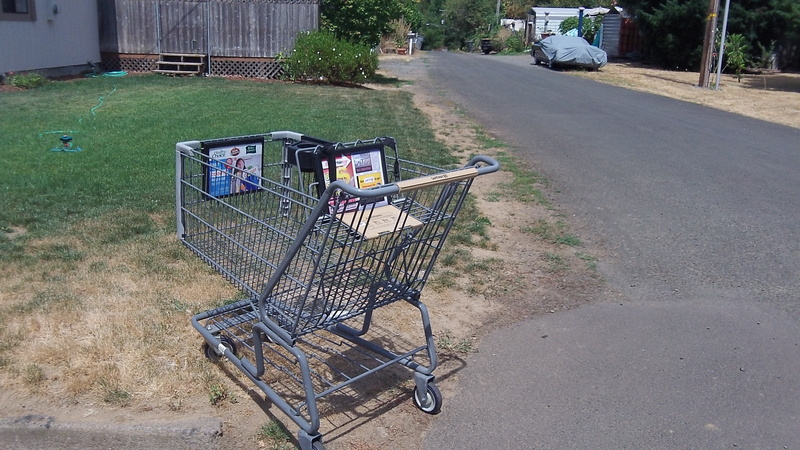 Someone left this shopping cart at Willamette Avenue and Alco Street, where it sat on Tuesday. Albany is taking steps to make the town less appealing to unauthorized campers, street corner beggars and drunks who become intoxicated in public and won’t use a portable restroom if they can use a bush. The city council Wednesday (Aug. 14) plans to vote on ordinances aimed at giving the police more tools to deal with people who cause problems by doing any of those things. 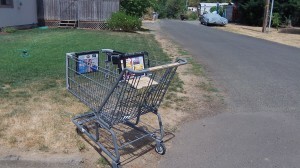 At a work session Monday the council heard a litany of complaints: People brawling and drinking themselves blotto on the bike path leading to Swanson Park, human waste fouling parts of the Willamette riverfront, squatters setting up camps in the riverbank wilderness, newcomers arriving near the river with their baggage in grocery carts and then abandoning the carts, as well as drug dealing and prostitution. One resident said he watched a man so drunk he fell into the Eighth Avenue Canal. (He was pulled out before he drowned.) Police Chief Mario Lattanzio said another man was taken to the hospital after he was found so intoxicated that he didn’t realize — or care — that maggots were eating his legs. The new ordinances make misdemeanors of having an open container of alcohol in public and of leaving human waste. The council also heard of plans for new signs telling motorists that impeding traffic — by slowing down to hand beggars money from cars — is unlawful and carries at maximum fine of $250.